Molí Nou | Ciutat Cooperativa is a railway station near Molí Nou in the municipality of Sant Boi de Llobregat (in the metropolitan area of Barcelona) operated by Ferrocarrils de la Generalitat de Catalunya as part of the Metro del Baix Llobregat and since 2002 (with the incorporation of L8) a line of the extended Barcelona Metro network. It opened on February 13, 2000. 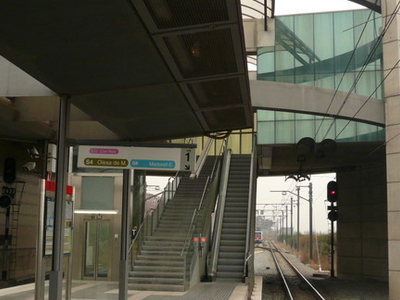 It's the current terminus of L8 and the last station of Metro del Baix Llobregat in fare zone 1. Here's the our members favorite photos of "Metro Stations in Barcelona". Upload your photo of Molí Nou - Ciutat Cooperativa!